A web-based GIS database was created to provide equal possibilities for all the countries involved dealing with transboundary and climatic issues to input data and to access the information. An open access GIS information system enables the information to be shared efficiently by stakeholders: governments, NGOs, the media, and other interested parties in and outside the basin. The creation of online databases enables a knowledge-based community to emerge, building on the collective expertise in the basins. Transboundary Pregolya and Neman river basins are shared by Poland, Lithuania, Russia and Belarus. Lithuania and Poland are European Union countries implementing the EU Water Framework Directive (Directive 2000/60/EC). Two non-EU countries Russia and Belarus are following their own path to sustainable management of water resources. Both Pregolya and Neman rivers pass through the Russian enclave Kaliningrad and are heavily affected by industrial and domestic wastewater discharge that reaches river water systems almost untreated. Beyond hampering development in Kaliningrad itself the situation also affects progress made by neighboring EU countries Poland and Lithuania ultimately decreasing the opportunities to promote rehabilitation of the Baltic Sea. The pollution from wastewater outlets is also high in Belorussian part of Neman basin. The nitrogen and phosphorous load from diffusive sources is high in all countries. Global climate change has additional influence on the natural regimes of river basins, lagoons and the Baltic Sea. Pregolya and the Neman rivers are heavily affected by anthropogenic pressures in all four countries. The lack of basin wide information on pressures and current ecological and chemical status of water bodies is an important issue for the sustainable management in the region. Due to the political situation in the region the sustainable transboundary management of river basins was limited. So far the planning of water resources was usually based only on national data. The main objective of activity was to develop the GIS platform as a tool to communicate the current situation in the region on water resources and to act as a decision support system on international, national or local levels. A GIS database consisting of 12 transboundary GIS layers (Table 1) and more than 100 attribute fields was created. The database content is based on national information. The information for different countries was obtained from various sources: official GIS maps, official statistical data, digitized paper maps, reports, literature, etc. The long list of sources meant that the detail level of the map was diverse. The data harmonization was necessary to provide the unified basin wide information layers. The GIS database is the collection of relevant data. To increase the value and the usability of collected data for end users, the GIS database was provided as a set of different products. For most advanced users the open access interactive GIS platform was created (http://levis-gdb.sggw.pl/neman_pregolya/). The interactive platform users can benefit by accessing all the information presented in database. They can create they own custom maps. In most cases the static representation of database is enough. There are 30 maps of surface and groundwater monitoring, human pressures and impacts, climate change impact, chemical and ecological status of water bodies available and ready to be printed (Figures 2a-2d). These maps may be used as good visualization tool in meetings or for preparation of dissemination material. For wide circle of users a video (http://vandensnamai.eu/management-transboundary-water-resources/) describing the content of GIS database was created. The video tells the story about the current situation, pressures and main water resources related challenges in the case area in an easily understandable way. Creation of a GIS Database was supported by the Integrated Drought Management Programme in Central and Eastern Europe (http://www.gwp.org/GWP-CEE/IDMPCEE/). The GIS provides a good platform for spatial data collection and sharing in transboundary basins. 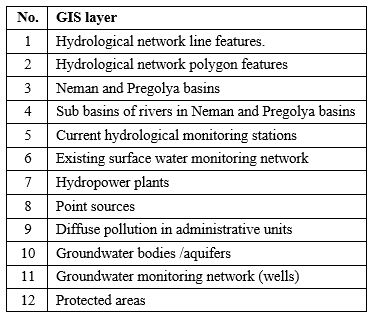 The experience and application of GIS in Neman and Pregolya basins can be used in most of other transboundary basins as well. The value of final product is highly related to the availability of data and on ability to harmonize it. The GIS based communication platform is a robust tool for the sustainable water management. It can be used to identify the most sensitive and most affected areas and to present this information for stakeholders and decision makers. Interactive GIS maps are good tools to improve the communication between experts from different countries or different municipalities and to aid in planning processes. The proposed solution is cost effective and not technologically demanding. The largest contribution in the development of platform was made by water management experts. The input from water management experts was essential to produce the unified or at least comparable data for the whole transboundary basin. Water managers are the main target group for the GIS platform thus they can provide the best solution for harmonization of the data. The harmonization should be focused on the creation of uniform data layers with the least possible loss of data. Once created, the GIS communication platform can be easily updated and maintained. The update costs depend on the availability of new data. Operational costs are limited to the expenses related to website maintenance.